There’s a philosophy behind Luna that we uphold in every circumstance: How can we consistently deliver excellence in physical therapy? How can we go about physical therapy in a way where we can turn every patient and therapist’s experience into something delightful? It was through this line of thinking that the Luna Concierge Service evolved. Whether you’re a patient or a therapist, here’s what you need to know about Luna’s Concierge Service. Luna’s Concierge Service makes the process of receiving at-home physical therapy easy and enjoyable. Our white glove concierge service ensures that every patient enjoys an amazing experience from start to finish. Not only will you have the freedom to receive care when and where you need it, you’ll also appreciate the fact that we make the entire experience as convenient as possible. Luna’s Concierge Service allows patients to schedule appointments on their terms, whether that’s online, in the app, or over the phone. With Luna, you’ll never need to delay your care due to waitlists or overbooked clinics. We’re also happy to help should you need to reschedule, cancel, or make any last minute changes. Our team is committed to serving you and helping you achieve the best possible experience. From scheduling to billing, Luna makes it easy and enjoyable to experience #physicaltherapy at your home. 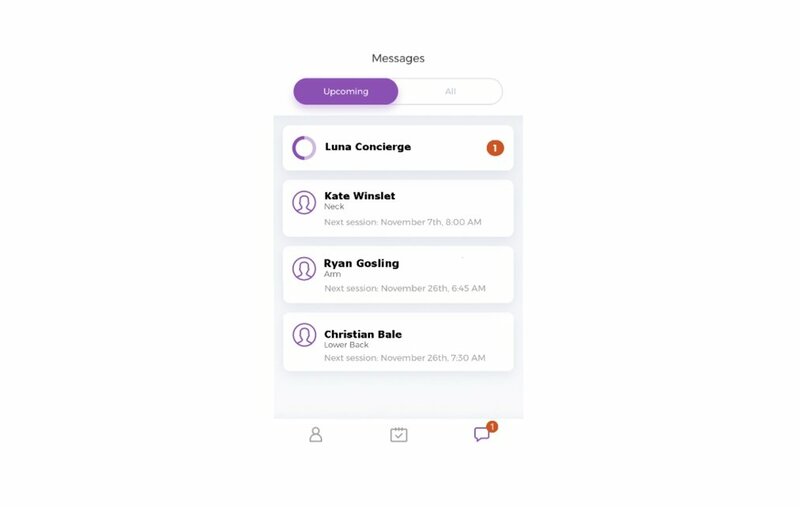 Luna’s Concierge Service allows for real-time communication directly within the Luna Patient App (iOS). Whether you need to get in touch with your therapist to let them know you’ll need to reschedule, or have a quick question for the concierge team about adding on more sessions, communication is quick and easy with Luna. Of course, you always have the option to call us. Someone from our team will always pick up and be happy to help. From paperwork to billing, insurance to payments, Luna’s concierge team handles all of the healthcare complexity for you. For example, we handle insurance benefits verification over the phone to confirm that our services will be covered by insurance. We’ll even communicate directly with your physician to keep them up to date on your progress and care. When running your own, at-home therapy service or looking for supplemental income on the side, it can be easy for little things to impede your ability to make a living. From safety, cancellations, and billing, to finding the patient home or facility; unique issues can make the independent therapist’s job more challenging than expected. Through the Luna Therapist App, you will be routed to your patients with a system that takes into account your location and potential traffic. We’ll tell you when to leave your current location to make it on-time to your next and any potential arrival instructions for entry and exit. The Luna Therapist App also ensures that all patients will be in your preferred vicinity, with less than thirty minute drives between locations. When gathering stories and insights on the industry from therapists, we’ve learned that physical therapists could lose up to 30% of their projected income from the day via no-shows and last minute cancellations. With the Luna Therapist App, we mitigate this instability and take care of all of the administrative woes that could potentially cause income loss for you. Luna is here to provide our therapists with a level of care they have not experienced working anywhere else. As a therapist, navigating the world of insurance billing can be frustrating. With Luna’s technology, you can get all the income benefits of being your own boss, with little to none of the setbacks. In the Luna Therapist App, therapists are able to see their earnings in real-time. Luna will also handle all insurance benefits on the patient side so that you can be free to do what you do best: work with your patients. With Luna, burdensome paperwork is a relic of the past. At Luna, we’re committed to providing unparalleled service and support. From our therapist and patient mobile apps to our Concierge Service, we’re working hard to deliver the best possible experience to both patients and therapists. We encourage you to learn more about Luna and get started today! This entry was posted in Luna Blog and tagged Therapists, Patients.